VALHALLA, NY--(Marketwire - August 12, 2008) - FUJIFILM U.S.A. Inc. today announced three new additions to their 2008 digital camera line up -- the D-SLR-styled, HD compatible FinePix S2000HD, the FinePix F60fd, a powerful, technology-rich compact digital camera and the ultra-compact, wide-angled FinePix J150w. Each camera offers the user a different option in features, styles and price points, meeting a full range of wants, needs and desires. The FinePix S2000HD is perfect for advanced amateur photographers and sports a 10-MegaPixel 1/2.3" CCD, a powerful 15x wide-angle optical zoom (27.6mm-414mm equivalent) and an extra large 2.7" wide-view LCD. As the first Fujifilm digital camera with HD compatibility, the FinePix S2000HD has the ability to capture still pictures in a true widescreen 16:9 aspect ratio enabling distortion-free full screen playback for the clearest display possible on an HDTV. The S2000HD can also convert movies in-camera into a HDTV signal output compatible with 720p (progressive) allowing the user to realize the full benefits of their home theater system. The FinePix S2000HD is small enough to fit in the palm of a hand and will debut at the retail price of $299.95 in September 2008. As the latest addition to Fujifilm's award-winning F-Series lineup, the FinePix F60fd, like the FinePix F50fd before it, combines intuitive use with the most advanced features and technology available, enabling photographers of all levels to capture the moment as their eye sees it. 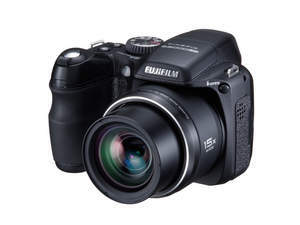 Featuring a 12-MegaPixel 1/1.6" Super CCD HR, 3.0x optical zoom and a new, extra large 3.0" LCD, the FinePix F60fd combines ease of use with a range of powerful features users have come to expect from Fujifilm's more advanced digital cameras. With the addition of Dual Image Stabilization, Face Detection 3.0 Technology with Automatic Red-Eye Removal function and new SR AUTO (Scene Recognition) mode, the F60fd takes compact digital cameras to a new level, arming users with a host of features and enabling them to take pictures never before possible. The FinePix F60fd will begin shipping in September 2008 at a retail price of $299.95. The FinePix J150w is the third model in its recently released J-series digital camera line. As with its J-series predecessors, the FinePix J150w is designed for consumers seeking an affordable digital camera without sacrificing features or style. Available in a handsome matte black or stylish brushed silver and housed in a compact metal chassis just 22.6 mm thick, the FinePix J150w conveniently fits into a handbag or pocket for quick accessibility. It incorporates a 10-MegaPixel CCD sensor, an extra-large 3.0" LCD and 5x wide-angle optical zoom lens (28mm-140mm equivalent on 35mm camera) from world-renowned lens brand, Fujinon that easily captures large groups or distant subjects. It also features Fujifilm's proprietary Face Detection with Automatic Red Eye Removal. The FinePix J150w will debut in September 2008 at a retail price of $199.95. NOTE: Individual new Fujifilm FinePix camera press releases, specifications and high-resolution photos are available at: www.fujifilmusa.com/press/news/recent_news. FUJIFILM U.S.A. Inc. is a marketing subsidiary of FUJIFILM Corporation, Tokyo, Japan, providing digital and analog photographic Imaging Systems, Recording/Storage Media and Motion Picture Film products and services to consumers, professionals and businesses. For more information on Fujifilm U.S.A. products, customers can call 800-800-FUJI or visit www.fujifilmusa.com. To receive news and information direct from Fujifilm U.S.A. via RSS, subscribe free at www.fujifilmusa.com/rss. FUJIFILM Corporation (NASDAQ: FUJI) brings continuous innovation and leading-edge products to a broad spectrum of industries, including electronic imaging, photofinishing equipment, medical systems, life sciences, graphic arts, flat panel display materials, and office products, based on a vast portfolio of digital, optical, fine chemical and thin film coating technologies. The company was ranked number 15 for U.S. patents granted in 2007, employs more than 70,000 people worldwide and in the year ended March 31, 2008, had global revenues of $24.7 billion. Fujifilm is committed to environmental stewardship and good corporate citizenship. For more information, please visit www.fujifilmholdings.com.